One of the best things about the Nexus line of devices is the ease with which one can achieve root. Plug your phone into your PC, download a couple files, type a few commands, and you can be rooted within 30 minutes. No muss, no fuss, no carrier-locked bootloaders. But it took one of the hardest phones to root thus far to bring hacker George Hotz (AKA Geohot) out of the woodwork. The Samsung Galaxy S5's root hunt garnered more than $18,000 in bounty to be awarded to anyone who could gain access to the popular smartphone's system partition. Hotz not only rooted the Galaxy S5, he did it in such a way that nearly any Android device with a kernel build date of June 3rd or older can be rooted using his exploit. This, of course, includes the Nexus line of devices, whose latest update came just before the cut-off line. Hotz's root method, Towelroot, is a simple app that can be sideloaded, then at the press of a button, it roots your device in under 20 seconds. If you haven't yet rooted your Nexus, give it a shot—it's the easiest root method yet. The video above shows me rooting the Galaxy S5, but the method will be the exact same for our trusty Nexus 4s and Nexus 5s, and even the Nexus 7. I'll be demonstrating these steps using a Nexus 5, but the process should be virtually identical on any current-generation Nexus device running stock Android. Since Hotz's Towelroot app is not available on the Play Store, you'll need to enable sideloading on your phone or tablet. To do this, just head to Settings, then tap Security. In here, tick the box next to Unknown Sources and press OK.
Hotz has made his rooting app available to everyone by way of its website. Open up the web browser on your Nexus and head to towelroot.com to begin. From here, tap the Lambda symbol to start the download, then press OK on any popup or warning message. Once the download is finished, tap the notification to launch the install process. On the next screen, just press Install to begin. When finished, hit Open. The Towelroot app only has one button, and that's the one that does all the magic. Simply tap make it ra1n to begin. The app will take about 10 seconds to copy over the necessary root files, then it will automatically reboot your phone. When you're back up, you'll be rooted—that's literally all there is to it. You just rooted your phone in less than a minute. Once your phone or tablet comes back up after Towelroot's automatic reboot, you can verify that root was indeed achieved by grabbing Root Checker from the Play Store. Just open up Root Checker and tap Verify Root to see the results. While doing this, you may have noticed that Root Checker didn't ask you if you wanted to grant it root permissions. 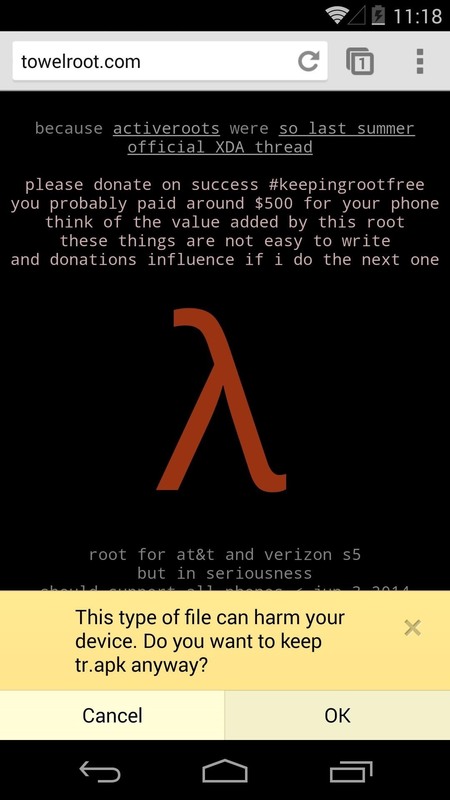 This is because Towelroot doesn't install a root management app—it just grants root to any app that asks for it. 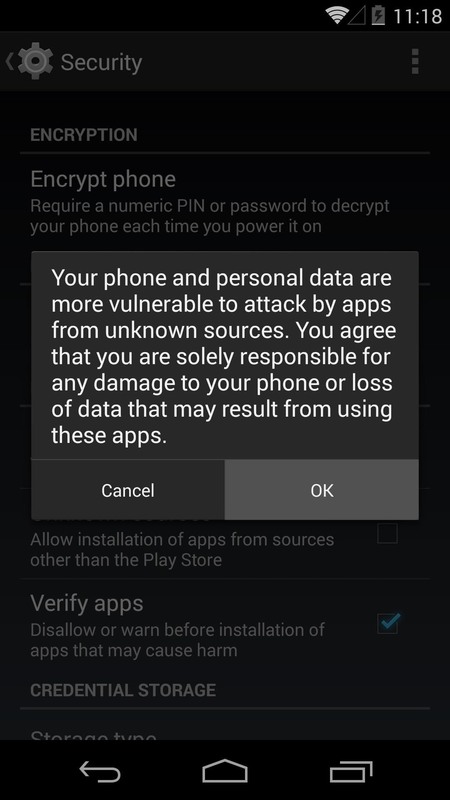 This is a huge security risk, because malware apps can do some serious damage to your phone if they were to be given root permissions. An app that somehow snuck its way onto your device could silently be granted superuser privileges, then have unrestricted access to sensitive data on your device. No worries though, there's an easy fix for this vulnerability. 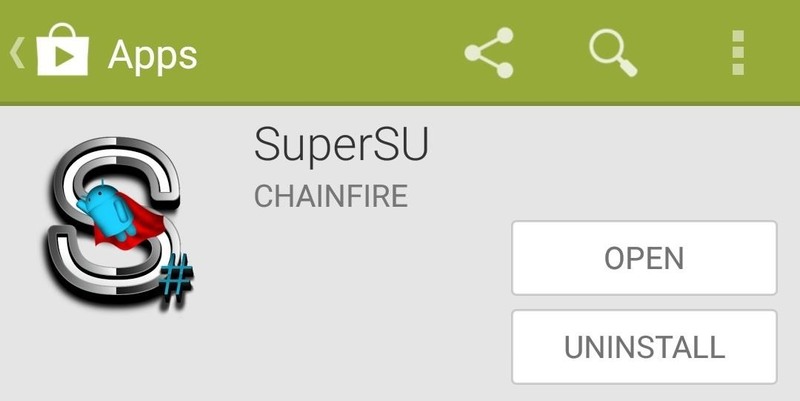 Chainfire's SuperSU is the leading root management app today. It offers compatibility with almost any root app and the latest versions of Android. With SuperSU installed, you needn't worry about malware apps sneakily gaining permission to access your system-level components. From the Play Store app on your Nexus device, search SuperSU to get the root management app installed. Alternatively, you can head to this link to jump directly to the install page. 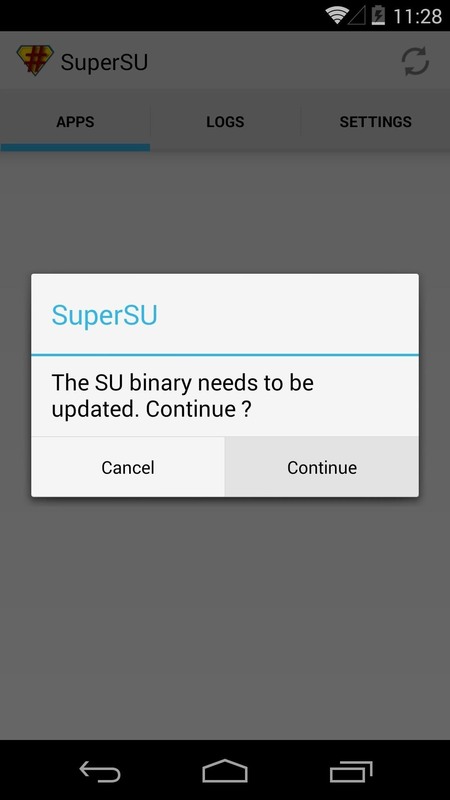 As soon as you open SuperSU for the first time, you'll be asked to update your Superuser binaries. Tap Continue on this first dialog, then choose Normal as your method of installation. When the process is finished, you should get a message telling you that installation was successful. Just reboot your phone now, and you'll have an awesome Superuser management app that will keep malware at bay. 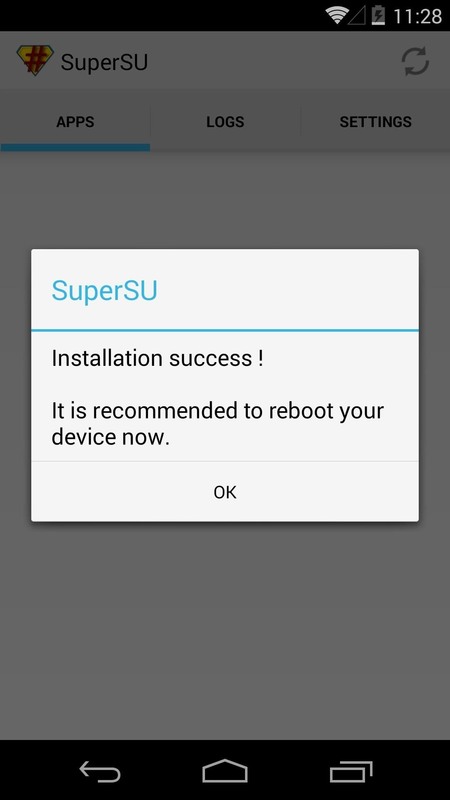 If SuperSU gives you a message that says "Installation Failed", just reboot your phone and run the process again. Regardless of what it says after the second attempt, the binaries will be installed. Give your phone one last reboot at this point, and you should be all set. With a root app that you installed yourself whose developer you trust, just tap Grant on first run. If a shady app that you don't recognize asks for root, simply hit Deny and it won't be able to access your system partition. Now you're Nexus is rooted, but it's still secure. You can start joining in on all of the root fun now. Perhaps even give the Xposed Framework a try and see all of the Gadget Hacks that opens up. This is honestly the easiest root method I've ever used. How long did it take you to root your phone or tablet? Let us know in the comments section below. Will this reset my device like other rootings? No this won't. It'll root, but everything else will stay exactly the same. Anyone tested this out yet? To answer my own question, I tried it on my v.4.4.4 nexus 5. The root process was successfull 100%. But, when I installed superSU, it reported that the installation of the binaries was not successful. Is it better to root in that way on the usual? I did this yesterday, works perfectly on my Nexus 5 and keeps all data intact, it's a better way to root than other methods because of the data retention (for me at least). With this way to root, is it possible to install a custom recovery? Absolutely! There are a few methods to do that, but the easiest (IMO) would be to download Goo Manager from the Play Store, hit the menu button, and select "Install Open Recovery Script". That will automatically detect your device, download the appropriate version of TWRP, and install it. This is fantastic! Hehe really could have used this about a year ago or so when I was first starting to root my device/s. I had an old Samsung that ran Froyo and it had the ability to be rooted with the same relative ease. I thought super fast, one button push rooting was a thing of the past with newer Android versions. Hey I have a Nexus 5 running 4.4.2. I wanted to know if I could use this method to root my phone and is there any chance that my phone could get bricked. I have a Nexus 5 running 4.4.2. Can I phone be rooted by this method and can it get bricked? Also is this the safest method there is? Hard to say 100% what's safe that what isn't. That being said, this method can't really "brick" your device. The worse that can happen if that it won't root your device. I have a stock/clean Nexus 5 running 4.4.3. Just wanted to ask if I needed to unlock my bootloader before I use this method of rooting my phone. Nope, no need to unlock. Just another question. My phone seemed to have downloaded 4.4.4. Would this still work if I update? Sorry for the questions, never rooted any of my past phones before. Yep! It still works on Android 4.4.4. So after a lot of thought, I finally caved and rooted my phone. Worked like a charm. I then checked to see if my bootloader was unlocked but it wasn't. Does it need to be unlocked for doing any customisation purposes? You'll need to unlock it to install a custom recovery. You'll need a custom recovery if you want to install new ROMs. But, for customization, all you really need (at least to start with) is Xposed, which does not require an unlocked bootloader. That's usually caused by a "bad" download. Download the app one more time and try again. I have downloaded it multiple times, and always the same result. I finally got it to reinstall and reroot. So nice having it back. Also, I tried to use towelroot on my toshiba tablet with tegra quad processor running jellybean, and when I hit the "make it rain" button, it just freezes up , and I have to restart after a long wait. Should this work on my tablet? or should I not bother anymore? Seems like it's not going to work with the tablet, as a very similar thing happens when using TowelRoot on the 2012 version of the Nexus 7.
if i root my nexus 5 can i updat my phone via OTA if any new verion of android is avilable ? if not what this the method ? In fact no. You have to unroot your phone to install an OTA update. Can this root my stock Nexus 5 running 4.4.4? And will I still be able to get updates? Hey I rooted my phone completely okay. But the super su app link on this page does not let me download. And when I downloaded from google play the binary update afield and I rebooted my phone but when I reinstalled it didn't ask for binary update. But I want to setting disabled and enabled and then it installed. However no app shows on my logs. Could u please help or give me adifferent link to su app. Don't want any malware please help. UPDATE: root checker now says that I don't have proper root. So I uninstalled towelroot super su and root checker. What do I do? The SuperSU app that's linked out in this article is an outdated version now. I'll update the article to add a link to the Play Store version, which is the most current one. For some reason, the SuperSU binary installer will occasionally fail on the first attempt. I suspect this is what happened in your situation, but otherwise, you did exactly what you should have done. 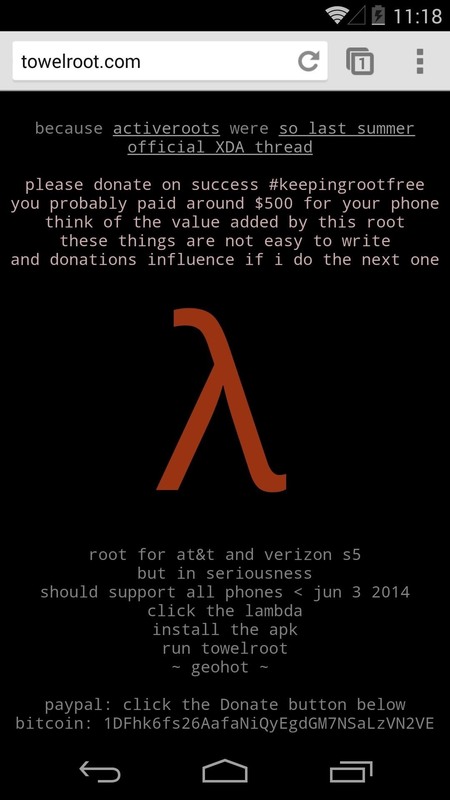 Give this a try: Install Towelroot again, run it, and reboot. Then, download the Play Store version of the SuperSU app once more. If it fails on the first attempt, reboot and try again. On the second attempt, it may say it failed, but the binaries are indeed installed. After that, reboot a final time. 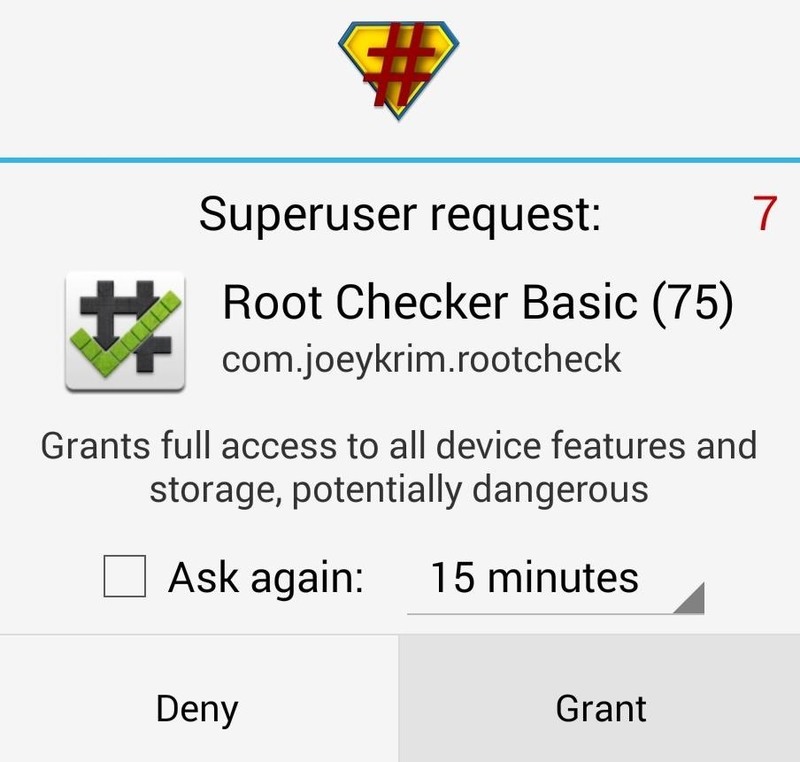 When you get back up, run Root Checker (give it a few seconds before pressing anything on the screen), and you should see a pop-up from SuperSU asking if you want to give Root Checker Superuser permissions. Grant it those, then it should tell you that your device is rooted. According to towelroot I am rooted. So will there be any complications if I reinstall towelroot and run it again? Root checker said I had root permission but like I said it afterwards told me I didn't. No, running Towelroot again will not cause any complications. I think Root Checker was telling you that you don't have root access because SuperSU was running a bit behind and Root Checker got auto-denied. But just to be on the safe side, go ahead and run everything again. 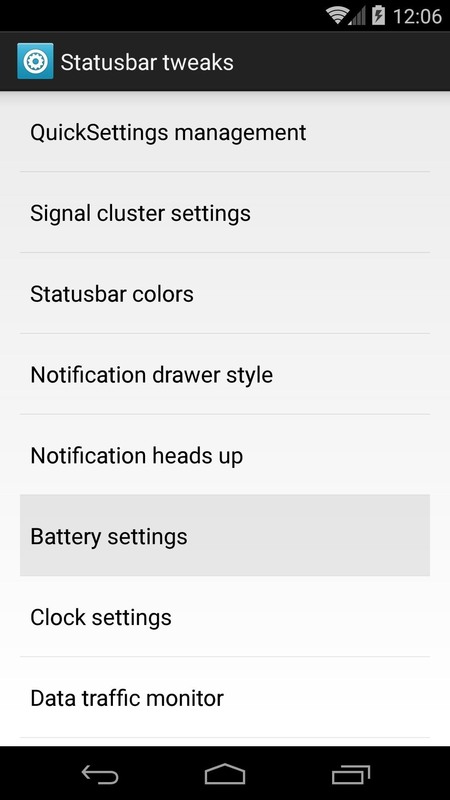 I use both of those modules on all my Nexus devices, and I haven't come across any conflicts...even with double-tap-to-sleep options enabled in both (double tap desktop in XGELS + double tap status bar in GB). Actually, those are by far my favorite Xposed Modules, and two of the main reasons I always root my Nexuses. i need u r advice..i have nexus 5 (4.4.4) and i want to root it..first of all towel root is trustable? i hear about NRT by wugfresh too (litlle complicated process)..which one is better from those? and some questions are here just want to conform.. plz help! If i root then i receive OTA from google .and updation for apps from google play store?? This process will swipe my all data or not?? 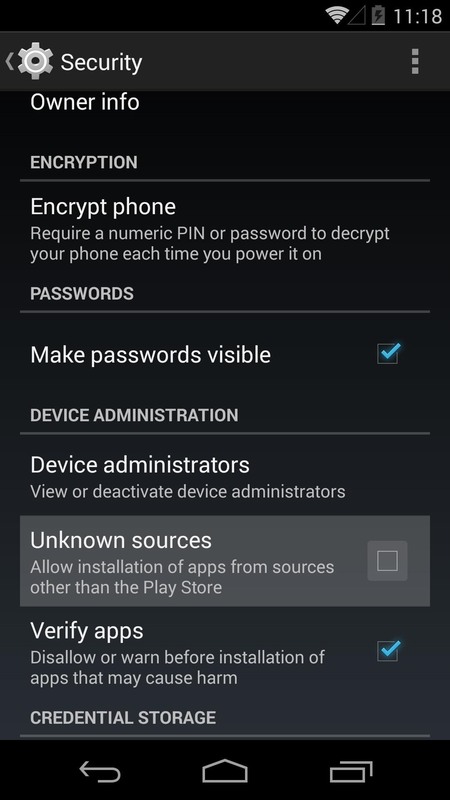 If i want to unroot my device then what can i do?? If i root my device then what can i do? (M just simple android user... thats first time that i will root my device) like best apps for rooted nexus5 and give some help full tips.. It all depends on which method you use. Personally, I would go with Towelroot, since it's so incredibly simple and you don't lose any data using that method. If you want to unroot your phone after the fact, it's as simple as going to the SuperSU Settings tab and tapping Full Unroot. This will unroot your device, but it won't restore it to stock, delete any data, or remove any other changes you made. If you want to make your phone completely stock again after rooting, you can follow this guide (it uses Wugfresh's NRT). As far as stuff to do with root...man, there's a LOT. But a good start would be to install the Xposed Framework. Here's a list of the guides we've made on various Xposed modules. DALLAS bro thanks for rply. I want to know which changes i make when i root my device and if i unroot my device by supersu. This app doesn't make me as stocked device? I meab which changes i make they kept as long as a rooted device or. Work on unroot also. If i do factory format or i i will update my device by OTA will lose my root access?? If i use xposed for customize (first off all xposed customize the kernel right?? It means i got updates with no worry? My moto is to save more battery and give great look to device. I heard about franco kernel. It is best? That's one's fairly easy...open up GravityBox and head to the Navigation Bar Tweaks section. From there, toggle the Master Switch to ON. 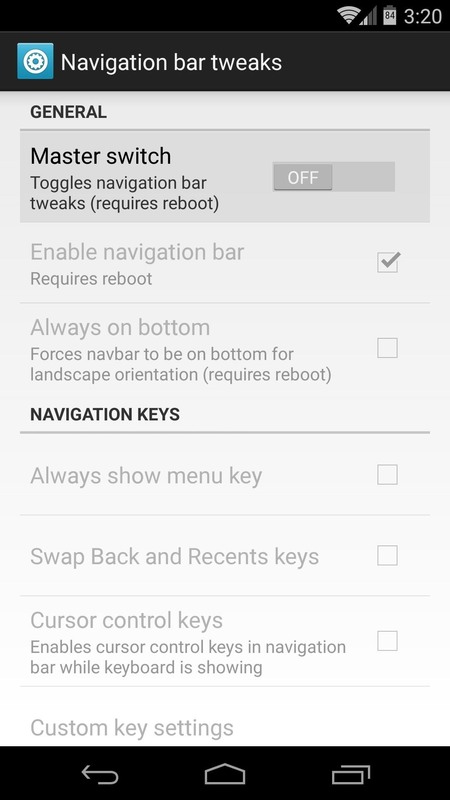 Then, untick the box next to Enable Navigation Bar. You'll see a toast message saying that the changes will take effect after a reboot, but we'll get to that later. After that, back out to the main screen again and head into Pie Controls. 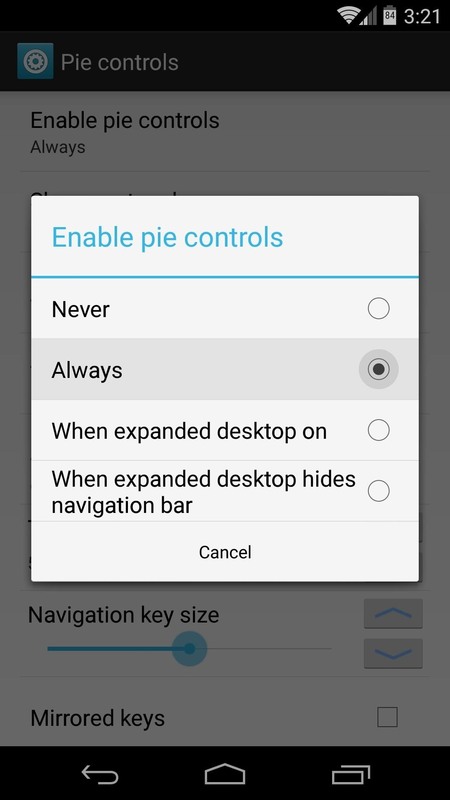 Tap the Enable Pie Controls entry and select Always. The rest of the options in the Pie Controls section are for customizing the Pie buttons and size and things like that. Hey Dallas how did u change your battery bar? It's looks stock but u can make out the percentage. 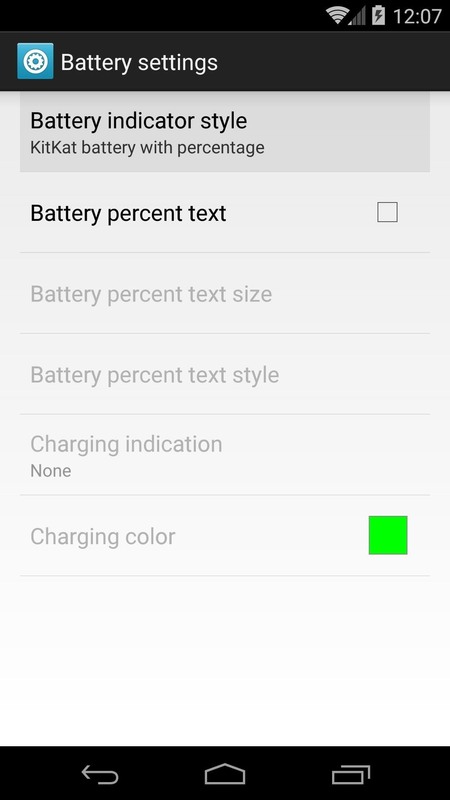 Is there any Xposed module that has different battery icons. Like with more choices. And what exactly does Greenify do? Is it worth downloading.my phones battery had been charging quickly after rooting and now it has slowed down. I am scared if I plug it in overnight it will explode. Since it happened with my last phone where the motherboard short circuited. Please tell me what I can do for this and if it is okay or not? 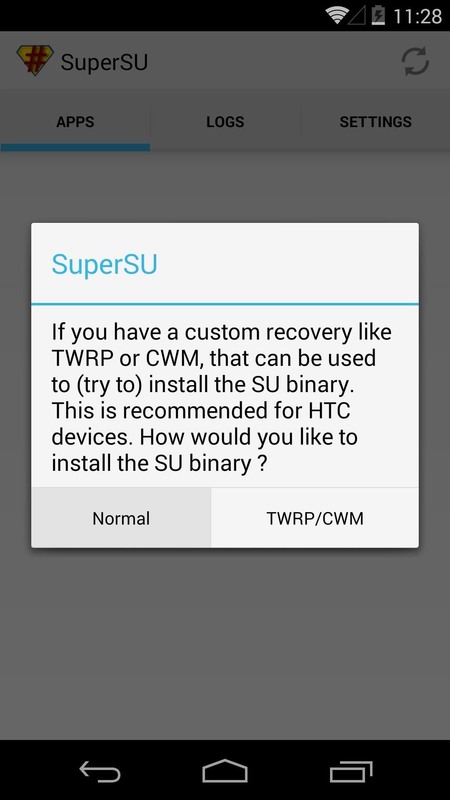 Quick question, I downloaded Super SU after using the Towelroot app and it never worked, so I rebooted and uninstalled it, if I uninstall Super SU does it also unroot my phone? Did u update the SuperUser binaries. Same thing happened with me. I uninstalled SuperUser, rebooted, ran towelroot again and then downloaded SuperUser. Then u should update the binaries. If it fails at first, reboot and then update binaries again. Wait for two minutes and open root checker. Wait a few seconds and u should see a pop up saying that root checker wants root privileges. 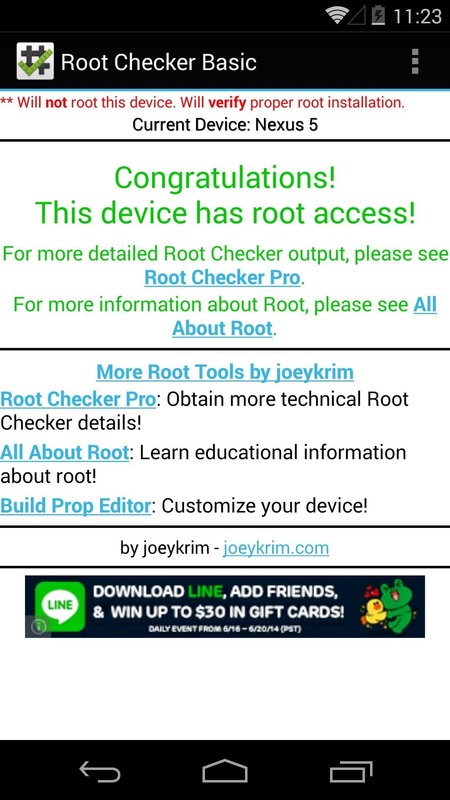 Grant it and root checker will now show u are rooted. And no uninstalling super SU won't Unroot your phone. 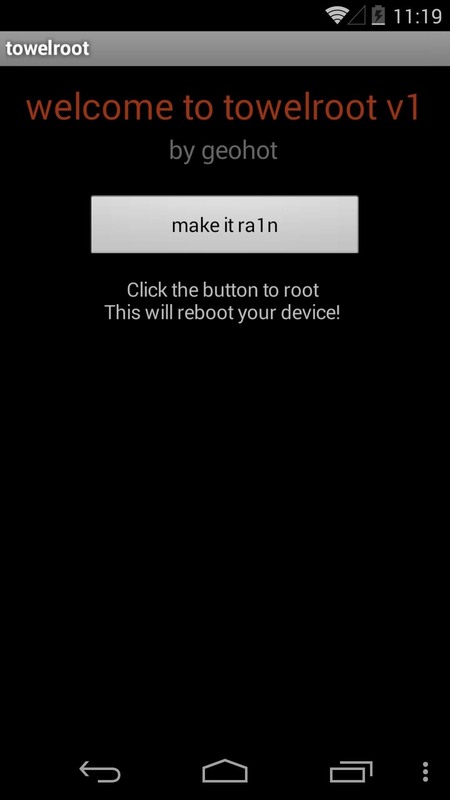 hey bro help me out here.. if i root using this method, wil i be able to use custom roms? can i do software updating directly when update pop up on notification? 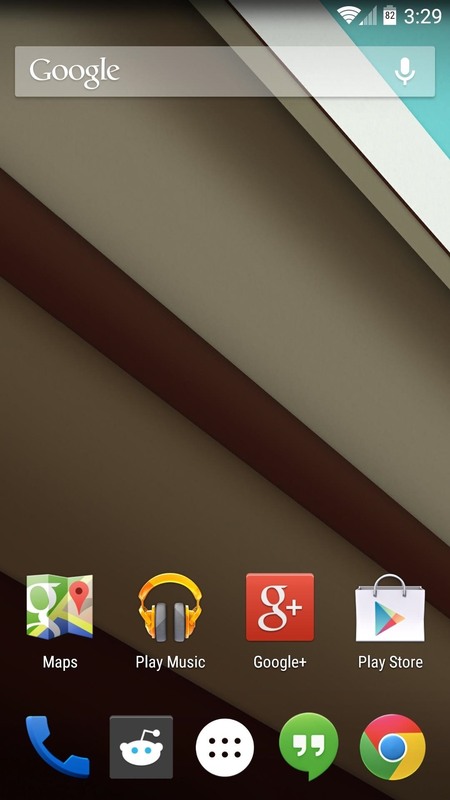 bcz m using google nexus 4. google will releasing all updates quickly for nexus device. wil i be able to use know features ? Custom ROMs require that you have a Custom Recovery installed, but that can be achieved pretty easily once you're rooted. Here's a guide you can use to install a Custom Recovery once you've already rooted using this method. It's incredibly easy, no computer involved, just install and run a couple of apps. Root itself will not prevent you from being able to install updates from the notification that appears when Google makes them available. However, if you change certain system files using your root access, the update may fail to apply. But again, just the fact that you're rooted won't change anything in this regard. 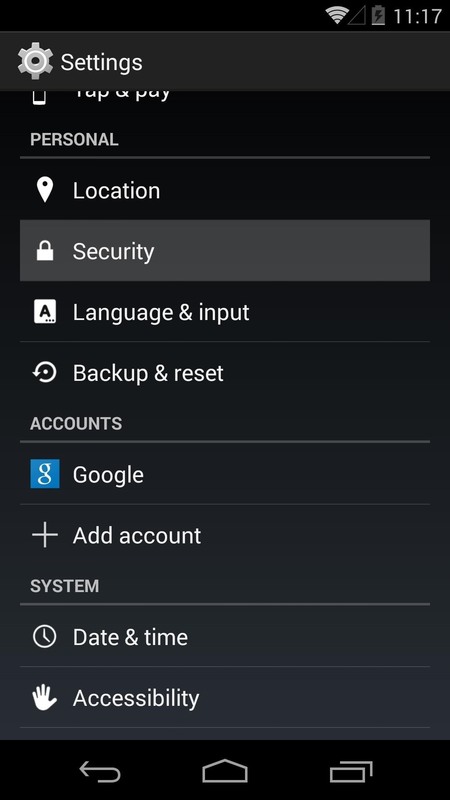 Even still, if you make a NANDroid backup immediately after installing Custom Recovery (that process is outlined here), you can always restore this backup and regain the ability to apply updates directly from Google. If you do opt to install a custom ROM, obviously Google updates will no longer apply. 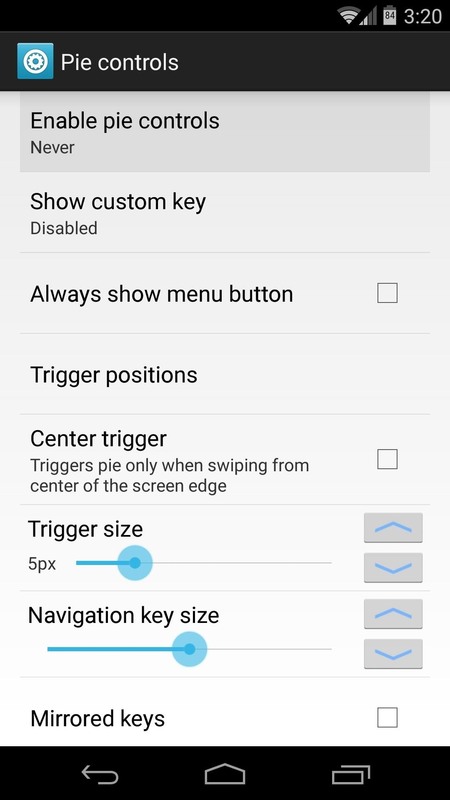 Custom ROMs can be updated by flashing the newer version on top of the existing one. there is one more question. wil i be able to use knock on lg optimus feature. there is a app called touch control, it requires root and xposed framework. wil i be able to get it withh this method? I have a nexus 5 with KitKat 4.4.4 on O2 in the UK. If I use this method above will it root my UK phone on O2 and will I lose any data / ready installed apps? Also am I ableb to de-root my phone if I needed to send it back for repair? Great tutorial. I appreciate the way you've replied to all the questions posted. Can you please help me out here? I haven't got an answer on this through Google: If I root my stock ROM using this method and install a custom kernel will I still get OTA updates? Most of the answers posted online are for unlocked bootloaders and whatnot. I'm considering Franco kernel at the moment for better battery life but I would like a hassle free way to update to the L update when it does come to my Nexus 4. I haven't installed Xposed or anything else (other than wakelock detectors) that might affect system files; just mostly looking to improve my battery performance. Hope someone can assist me. I have gone to download the towelroot app on both chrome and firefox on my Nexus 4 and on chrome, it brings up a blank tab. 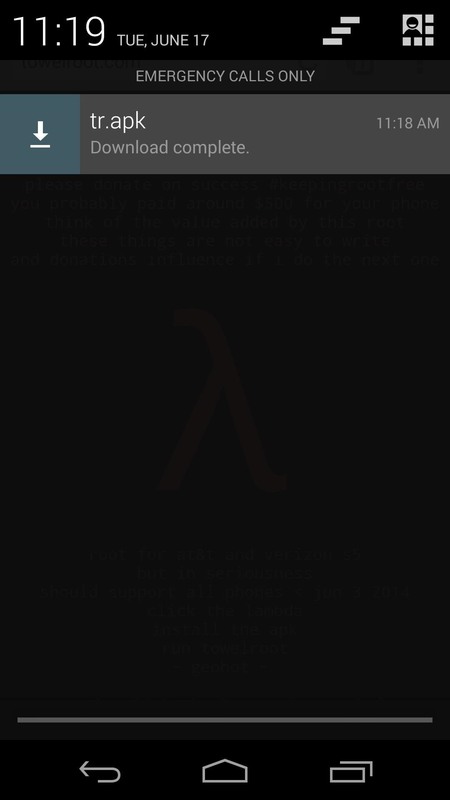 On firefox, it opens and shows the text of the .apk file. I was going directly through the towelroot.com site. Okay. I got it. Downloaded the apk to my PC, copied it to the phone, and now I've got it installed. You can use Wugfreshs NRT. There is guide on this site itself. Might seem complicated at first but not that hard. When clicking the lambda it just keeps opening new browser tabs over and over until you force close the browser app. Does this method no longer work? I have the same problem...just opens up many webpages but doesn't install anything. Any helps? I also tried to unroot using the SuperSU...but it said to wait..but after over an hour and nothing...I turned it off and back on. I did verify with RootChecker that it is still rooted (although it was not easy to root the 1st time). I tried to update my 4.4.2 to 4.4.3 and it came up with an error. Any help would be so appreciated. Thank you for all your work to try to help us. Try long-pressing this link, then selecting Save Link As.... The towelroot webpage seems to be acting up on some browsers, but that's a direct link to the towelroot installer file. As for the SuperSU unroot procedure, it can some times be a little wonky, so I'd suggest giving it another try. If it takes more than 5 minutes, just reboot and try again. The times I've done it in the past, it only took a couple tries. So is it just down right now? Thanks again for your help. You shouldn't have to long-press that one or anything, it should just be a normal download. Thank you. That worked...finally gor the towelroot to install and all went well, until I went to update from 4.4.2 to 4.4.3...it came up with an error that says "/system/build.prop" has unexpected contents. E:Error in /cache/.........etc. If you need that info to help problem solve and does not open me up to someone hacking in...let me know.Any ideas on how to help with that? So I went to superSU and sucessfully uninstalled the root, and then tried to do the update...and again an error? Should I just be happy with the 4.4.2 version? Or should I put it back to factory reset and reinstall everything? Hi Dallas. First of all, I salute you for your patience and excellent replies to every single question. I am facing a small difficulty in the above procedure. 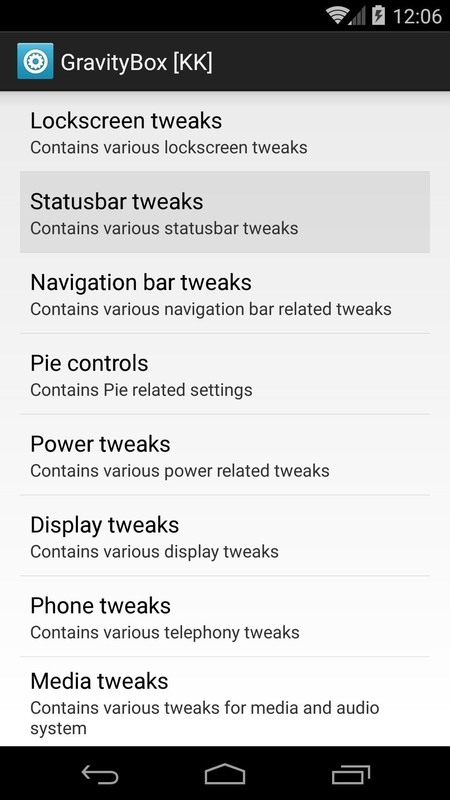 I am running on stock Lollipop and I have the apk installed from towelroot on my phone. When i open the application to install it, it seems like the install button is frozen. No matter how many times i tap on install, its unresponsive. But the cancel button works just fine. Could you please help me get through this. Thanks in advance. 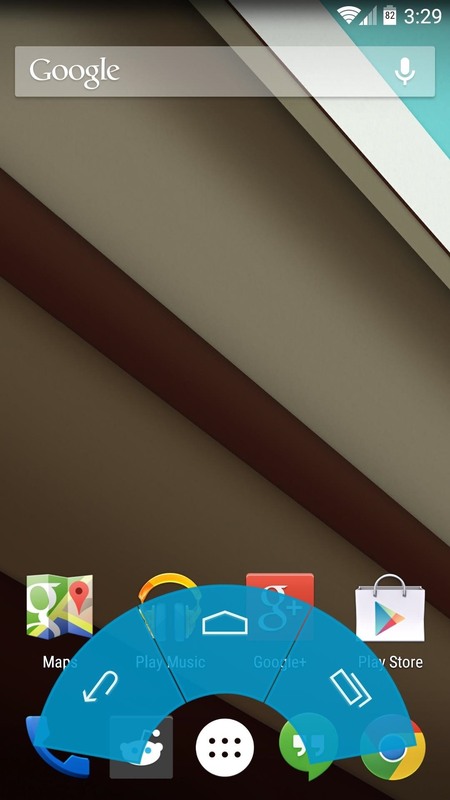 My Nexus 4 just received Lollipop last week. Towelroot install indicated that "device isn't supported" after hitting the let it rain button. I wasn't able to download the apk onto the phone itself, but had to download to a pc and transfer over. Can you offer suggestions about what I can do. I'd prefer not to lose everything currently on the phone. Do you have a custom recovery installed? If so, rooting Lollipop is as easy as flashing this ZIP. If not, is your bootloader unlocked? You would be able to tell by looking at the bottom of the "Google" screen that comes up when you're rebooting your phone. If there's an "Unlocked" icon at the bottom, then your bootloader is unlocked. If there's nothing at the bottom, it's locked. If your bootloader is unlocked, you could easily root with CF Auto Root and not lose any data. I did a writeup on this process for the Nexus 6 at this link. For the Nexus 4, the process would be exactly the same, save for the fact that you'd have to use this version of CF Auto Root instead of the one linked out in that article. If your bootloader is indeed locked, you may not be able to root without losing all of your data. CF Auto Root would still root your phone, but the script it uses to do so unlocks your bootloader, and that process wipes all of your data. 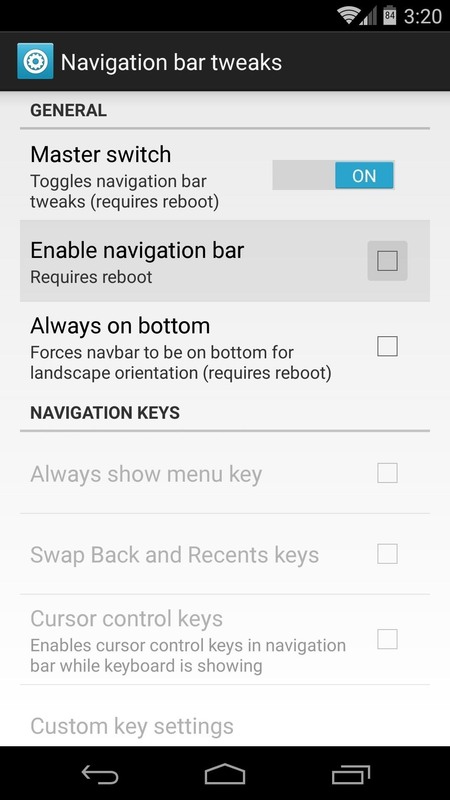 You could try the Nexus Root Toolkit, and I've got an article on how to use that program to root Lollipop at this link. That tutorial is geared towards the Nexus 5, so you'd have to select Nexus 4 and 5.0 (LRX21T) as your device and Android Version instead of what is shown there. Try it without performing Step 4 in that article, which is the part that unlocks your bootloader and wipes your device. That may not be required any more because of recent changes to the Lollipop root method, so this could be the solution you're looking for. If it fails, though, the only downside is that you'll still not be rooted, so there's no harm in trying. Hi there. The CF Auto Root worked just fine but when i used root checker to check, it said failed. The NRT worked perfectly and now i have a rooted Nexus 4. Thanks very much. I have one question. Im unable to install some apps and when i try to install it, it seems like the install button is frozen. No matter how many times i tap on install, its unresponsive. But the cancel button works just fine. So i just want to know how i can install the app from my pc instead. Thanks again. Go ahead and use the method outlined here. While that guide is for the Nexus 6, you can use the same process... the only difference is that this is the CF Auto Root file you'll need. I received a note saying , the phone isn't currently supported. Hey Bro Need a help when i m clicking on "make it ra1n" it is saying "This phone isn't currently supported"
pl help what to do....? and one more thing i m totally new to word ROOT so please help me in simple language. Let me start by saving you some time—this method will no longer work on any Nexus device. But rooting a Nexus is still fairly easy. I have a more up-to-date guide available here. That guide was done for the Nexus 6, but if you're on an older Nexus, you'd just have to download a different CF Auto Root file. Here's CF Auto Root for the Nexus 4, and here's the one for the Nexus 5. To answer your second question, root is a relatively simple concept. 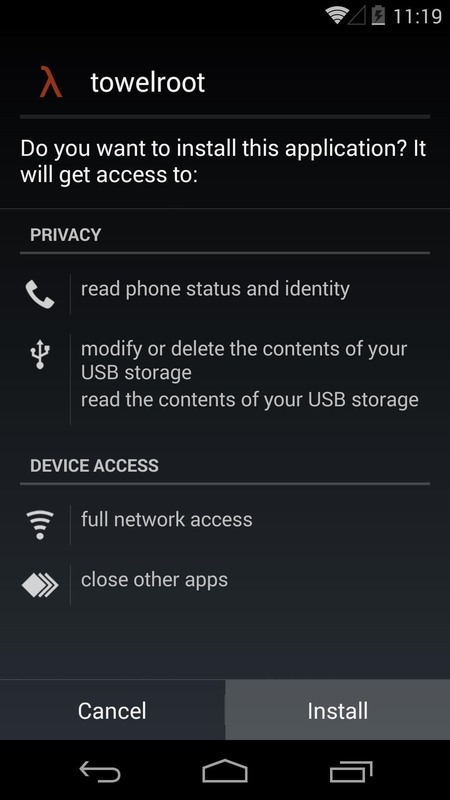 It just means that you are allowed to access the root partition of your device. To put it simply, the root partition is the highest folder you can get to in the folder tree—so if you're familiar with Windows, think of this like being able to access the C:\ drive. Once you're rooted (meaning you can access the root folder on your device), you can modify files that are stored in the root directory of your device. And since this is where all of the core Android system files are stored, being rooted means that you can modify Android itself. So again with the Windows analogy, think of root like being able to access the C:\Windows\ folder, where you can copy and paste files that would alter Windows itself.